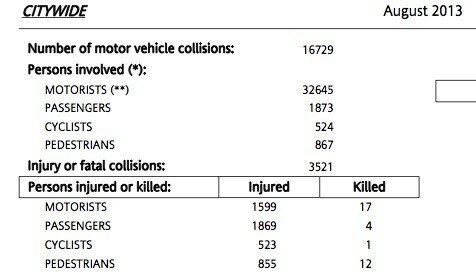 Thirty-four people died in New York City traffic in August, and 4,846 were injured, according to the latest NYPD crash data report [PDF]. As of the end of August, 103 pedestrians and cyclists have been killed by city motorists this year, and 10,336 injured, compared to 103 deaths and 10,027 injuries for the same period in 2012. Citywide, at least 12 pedestrians and one cyclist were fatally struck by drivers: three pedestrians in Manhattan; two pedestrians in the Bronx; two pedestrians in Brooklyn; four pedestrians and one cyclist in Queens; and one pedestrian in Staten Island. Among the victims were Jose Argueta-Pedilla, Kyrillos Gendy, Kenneth Yard, Manual Campoverde, Jhonn Carlos Fernandez, Gary Zammett Sr., Meipui Chow Leon, Lakhranee Sookram, Lyubov Angert, Abigail Lino, and an unnamed male pedestrian in Queens. At least one child and four seniors were killed by motorists in August: Kyrillos Gendy, 5; Kenneth Yard, 65; Meipui Chow Leon, 73; Lakhranee Sookram, 67, and Lyubov Angert, 82. Across the city, 855 pedestrians and 523 cyclists were reported hurt in collisions with motor vehicles. Per NYPD policy, few of these crashes were investigated by trained officers. Of 11 fatal crashes reported by Streetsblog and other outlets, no motorists were known to have been charged for causing a death. Historically, nearly half of motorists who kill a New York City pedestrian or cyclist do not receive so much as a citation for careless driving. Seventeen motorists and four passengers died in the city in August; 1,599 and 1,869 were injured, respectively. Seventeen is by far the highest number of motorist fatalities in a single month since January 2012, when Streetsblog began compiling monthly NYPD data. There were 16,729 motor vehicle crashes in the city last month. Download August NYPD summons data here. Crash and summons data from prior months is available in multiple formats here. After the jump: contributing factors for crashes resulting in injury and death. We can’t really expect the cops to worry about stuff like this when they’re so busy stealing people’s bicycles – because, y’know, terrorism! Note that 1,378 pedestrians and cyclists injured in a month is about two an hour–or the same number of violations per hour that Schwartz and Soffian claimed to have seen in their NYDN op-ed. They should really have been embarrassed to put that number out there . . .
It’s hard to know the exact rate for such an infrequent event accurately, and I think “fewer than one” is a fair enough description. I take it loosely to mean “somewhere between 0.1 and 1”, and I think you would agree that the “true rate” is likely to be in that range. If you just pick the last four years, it would be 0.25/year, for example. Consider that even if the “true rate” were as high as 1.0/year, it is still not that unlikely to find three consecutive years with zero fatalities (the odds are around 5%, calculated using the Poisson distribution). On the other hand, the claim that they only saw one or two drivers violating the law in an hour is laughable. It seems that each month, as a percentage of total involvement, bicycling fatalities are quite low compared to pedestrians. EG, this month bicyclist fatalities were 1 in 524 while pedestrian was 12 in 867. A bicyclist involved in a crash is much less likely to be killed than a pedestrian (then again, those in cars are certainly safest with about 21 fatalities in 33,000 and as a percentage of total numbers bicyclists are far more likely to be involved than a pedestrian). I think conventions of rounding suggest that “fewer than one” means .5 to .9 and thus think “a little more than zero” rather than “fewer than one” is more accurate. But English is not very accepting of that kind of phrasing. There’s reason to be cautious about this trend. And you have a much more robust mathematical justification for that than I could ever come up with. But I guess this was just part of my “with friends like these” response to that op-ed. You have to take into account where they likely were when they only witnessed two driver violations an hour. Already noted but just to emphasize, all the pedestrians were killed with motor vehicles, and even all the ones killed walking on the sidewalk were killed with motor vehicles operating on the sidewalk. None of the few pedestrians injured with bicycles on the sidewalk have died. Well, doesn’t this put to rest the myth that slow drivers are dangerous? 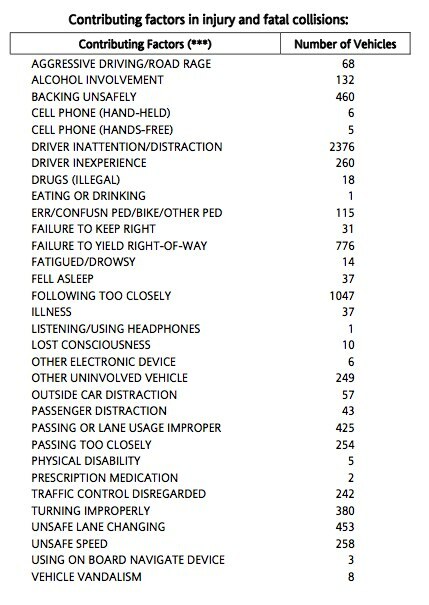 Driving slowly does not appear on the list!